My great-great grandfather, Cornelius Vincent DeLong was born on February 2nd, 1843 to Cornelius and Nancy (Hall) DeLong. 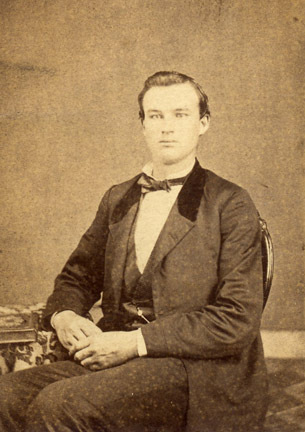 Cornelius Vincent dropped his first name and was commonly known as Vincent DeLong. Vincent enlisted in the 24th Regiment, New York Infantry on August 17, 1861. He was wounded at Antietam, September 16-17, 1862 and discharged that November. In January 1864 Vincent re-enlisted. This time in Company G of the 24th Regiment, New York Cavalry. During his time the 24th Cavalry fought the Battle of the Wilderness, Spottsylvania Court House, and participated in the Siege of Petersburg. The 24th was at Appomattox Court House for the surrender of Lee and the Confederate Army. In 1864 Vincent DeLong kept a diary. His diary has been handed down through four generations of our family. Starting today and throughout the year I am going to put the entries of his diary online. I'll also post Civil War and family information when appropriate. The diary itself is leather-bound, six inches by three inches and printed by Kiggens and Kellogg of 123 and 125 William St. in lower Manhattan "For the purpose of Registering Events of Past, Present and Future Occurrence." There's about an inch-and-a-half of writing space per day in the diary. Sometimes Vincent has a lot more to say than space allows. That's fine, but it does complicate how I will present the entries here. My intent is to post his entries as complete thoughts. That is, where it is clear he is running over a day in his diary entry I'll count that as one entry, and not split it over several days. The first few entries were clearly written in 1865 looking back to 1864. I'm going to keep the text as close to how it was written. Be forewarned, Vincent wasn't too keen on punctuation. Finally, much of the diary was written in pencil. In some cases the writing has been smudged and is very difficult to read. There are also many instances where the writing is not very legible. I'll do my best and will indicate in parentheses when I'm having trouble making things out. With that preamble in mind, let's see what my great-great grandfather was doing 131 years ago. I have something like 50 Dollars due me some of 1864's pay after they keep 21.20 for my Transportation home August last. Got another Furlough untill the 4th of February. Undated photograph of Vincent DeLong. On the back of the photo it says "D.W. Grout Photographer, Pulaski, NY".